As a child, I used a light microscope in my "crime lab"; later I was trained in microscopy in lab courses such as botany and, especially, microbiology at the University of Kentucky. 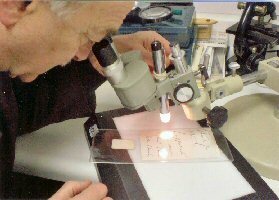 I now use microscopes regularly in my work as a Historical Documents Consultant - the stereomicroscope to study handwriting and other features, and the light microscope to identify, say, wood-pulp paper (by discovering tracheids [cells] of angiosperms). I was fortunate to know one of the world's foremost microscopists, the late Walter C. McCrone, whose counsel I always valued.